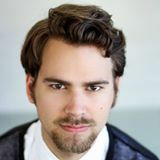 Baritone and composer Joel Balzun holds a master’s degree in vocal performance and literature from the Eastman School of Music, where he studied with Jan Opalach and Benton Hess. At Eastman, he was nominated for the Teaching Assistant Prize for Excellence in Teaching. He currently serves on the voice faculties of Biola University and Fullerton College. In addition to teaching voice lessons at both institutions, Balzun also teaches group voices classes and song literature. At Biola, he previously served as the vocal coach and rehearsal pianist for Biola Opera, and the director of Opera Scenes. Balzun made his solo debut at the Kennedy Centre in 2014, singing excerpts from Turandot. As a 2016 fellow at the Tanglewood Music Center, Balzun sang alongside Stephanie Blythe in a concert of American song and Dawn Upshaw and Sanford Sylvan in Shostakovich's brooding Symphony No. 14. Other past appearances include the title role in Don Giovanni, the Four Villains (Les contes d'Hoffmann), Prince Yeletskiy and Count Tomskiy (Pikovaya Dama), Albert (Werther), Belcore (L'elisir d'amore), Dr. Malatesta (Don Pasquale), and Valentin (Faust), among others. His acclaimed performance of Johannes-Passion with the Rochester Bach Festival was broadcast multiple times across the United States. An avid proponent of the music of living and contemporary composers, Balzun won critical acclaim for his portrayal of the titular Joseph de Rocher in the South Florida premiere of Jake Heggie's Dead Man Walking with Miami Music Festival. He worked with the composer on this work, as well as the role of Charlie in excerpts from Three Decembers. On the concert stage, he has championed rarely-performed works such as George Rochberg's String Quartet No. 7, as well as Peter Maxwell Davies' virtuosic Eight Songs for a Mad King, and numerous performances of Biola faculty member Robert Denham's Sutter Creek, among others. Also an accomplished composer, Balzun was a multiple prize-winner in the 2017 SOCAN Foundation Awards for Young Composers. Other accolades include winning the Dallas Wind Symphony’s annual Call for Fanfares and both the Young Composers Prize and the Grand Prize in the National Broadcast Orchestra’s Galaxie Rising Star Composers’ Competition. His music has been performed across the Americas as well as in Asia. For more information, including upcoming performances, visit www.joelbalzun.com.